The Eagle Creek Fire has grown to encompass more than 41,000 acres in the last few days, however firefighters say they’re making progress as they reach 28% containment, according to KATU Channel 2. So far, the Hood River County Sheriff’s Office’s aircrafts (planes and helicopters) dumped almost 100,000 gallons over the fire on Thursday alone as crews continue to build containment lines around the fire with regular patrols to protect residents. I-84 is now open, however all national forests in the fire area remain closed. All Level 3 evacuation notices have been lowered to Level 2, permitting people to return home however to also remain vigilant. Dry air and a lack of humidity will be challenging firefighters efforts to contain the Eagle Creek Fire which has now burned 35,588 acres according to KPTV Channel 12. Although officials believe the fire is 11% contained, the concerns about westerly winds and additional dry air could exacerbate the fire as we wait for the cooler weather coming Thursday. A total of 905 people are working on fighting the fire at the present time. Our thoughts and prayers go out to these courageous individuals. Firefighters are engaging the Eagle Creek Fire using additional helicopters as the smoke levels have dropped over recent days, reports KOIN Channel 6. Officials are making getting residents back to their homes and opening the I-84 interstate their top priority, as the Red Cross says they still have 170 people in their shelters. Although this is some good news, reports from the firefighters still indicate we have a long way to go, and since fires are incredibly unpredictable, we should temper our expectations for the moment. News from the U.S. Forest Service regarding the Eagle Creek Fire continues to be discouraging. According to the Oregonian, Forest Service Spokesman Paul Cerda acknowledged the size of the fire could double in size growing to nearly 70,000 acres, more than 100 square miles, before being fully contained, hopefully by the end of the month. Fire containment remains at 7%. We remain disappointed with the use of the description “natural disaster” when talking of the Eagle Creek Fire, specifically, as at least one 15-year-old suspect from Vancouver is being investigated for intentionally throwing lit smoke bombs into the area, allegedly starting the massive fire. This act is far from what we would describe as a “natural” cause. We will continue to follow the diligent reports of our local media outlets as well as the courageous firefighters and Forest Service employees engaging this enormous blaze. The Eagle Creek Fire continues to challenge firefighters with the Oregonian reporting the fire remains at 7% contained and level 1 evacuation being expanded further near Hood River. Level 2 evacuation has been extended east of Cascade Locks and now includes Wyeth at level 2. Tony Tooke, who was only just sworn in as Chief of the U.S. Forest Service on September 1, will tour the fire damage sometime today with a media briefing scheduled to be underway as of the writing of this update. Hopefully, we’ll have additional information to report as a result of the briefing. Unfortunately, little progress has been made over the past 24 hours. The Oregonian reports that the fire is now 7% contained, however more evacuation notices have been issued by the Hood River County Sheriff’s Office and more businesses have been closed. Evacuation areas are being extended east to Viento State Park, along the I-84 corridor, including the whole area of Wyeth. Click here to read our Friday, September 8, 2017 post about the teen(s) involved in starting the fire along with determining an appropriate punishment for destroying 33,000 acres of forest. KATU Channel 2 reports that the Eagle Creek Fire containment still holds at only 5% contained. The Eagle Creek Fire’s priority level has been elevated to the top fire priority in the United States. The Oregonian reports the fire’s size has now increased to 33,000 acres. As the Eagle Creek Fire continues to burn, estimates suggest that more than 32,000 acres (that’s 50 square miles) are on fire with 220 people seeking shelter assistance and more than 900 courageous firefighters involved. KOIN Channel 6 reports the Eagle Creek Fire is currently only 5% contained. All local media are closely covering this story so we will continue updating as we get more information. 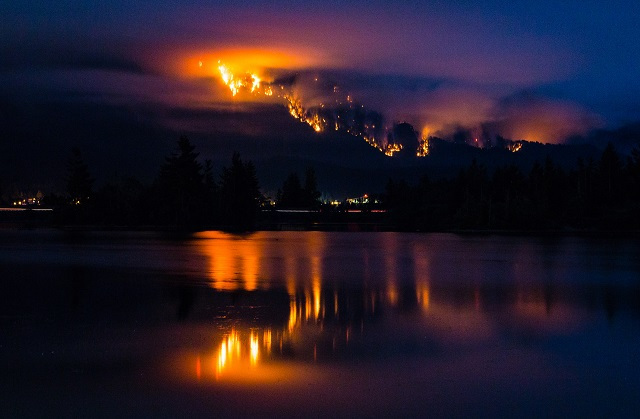 According to the Willamette Week and other media outlets, the Eagle Creek Fire appears to have been caused by teenagers throwing lit smoke bombs off cliffs in the Eagle Creek area. Click here to read our Friday, September 8, 2017 post about the teen(s) involved in starting the fire along with determining an appropriate punishment for destroying 33,000 acres of forest. Here at Stumped in Stumptown, we love fireworks displays. Fireworks can be awe-inspiring to behold. In Portland, we’re incredibly lucky because several organizations put on gorgeous displays every year. Just around the Portland area in 2017, there were three separate massive fireworks displays in Oregon: the Waterfront Blues Festival, the Oaks Park Pepsi 4th of July Spectacular, and the Lake Oswego Community July 4th Fireworks. Fort Vancouver, located just across the river in Vancouver, Washington, puts on a fantastic display each year which costs more than $300,000 to produce. Tickets to the Waterfront Blues Pass only cost $15 a piece and children age 6 and younger were free with an accompanying adult. Is $15 a person too much for a multi-hundred thousand dollar fireworks display? That’s cool – drive across the river to Fort Vancouver. How much did it cost to attend Independence Day at Fort Vancouver in 2017? Nothing. Zip. Zilch. 100% free. In fact, the City of Vancouver, which banned the use of all fireworks within city limits beginning in October 2016, even provided free transportation to and from the event. It’s not about injuries. It’s about fires. The American Pyrotechnics Association (APA) claim fireworks cause very few injuries. According to the Consumer Product Safety Commission’s (CPSC) study of 2016 injuries released in June 2017, this claim is true with fireworks causing a relatively low 11,000 injuries throughout United States each year. However, the statistic that the fireworks association doesn’t want to talk about is the number of fires started by fireworks. Fireworks caused an estimated 15,600 fires in 2013 alone including 1,400 structure fires, 200 vehicle fires, and 14,000 outside fires, according to the National Fire Protection Association (NFPA). During 2015, there were a total of 49 fireworks-caused fires in the City of Portland according to the city’s own reporting. Let’s put it this way: that’s nearly a fire every week caused by fireworks. Unfortunately, the majority of fires typically happen around the 4th of July which means the Portland Fire Department is strapped putting out fires caused by drunken party people playing with explosives instead of helping those really in need. And Portland isn’t the only one experiencing fires caused by fireworks. In fact, just this year at about 4 a.m. on July 5, 2017, one of Clark County’s own Councilors, Julie Olson, had her house nearly burned down due to the misuse of fireworks. Ms. Olson’s neighbors alerted her to the fire, preventing her house from being burned down, however Olson’s house incurred tens of thousands of dollars of damage. Although the City of Vancouver banned the use of all fireworks late last year, Clark County, where Ms. Olson resides, did not. And, now, Oregon and Washington are suffering from one of the biggest forest fires in their histories, endangering homes and property; trapping hikers and tourists who just want to enjoy the outdoors; and causing thousands of acres of forest to burn, all caused by a few teenagers misusing fireworks. Fireworks can be Weapons of Mass Destruction. There are no regulations requiring fireworks training for fireworks. Anyone 15 or older can buy them. Since fireworks are often used during holidays and celebrations, the chances that alcohol-related impairment might affect people using fireworks are much higher. This misuse of fireworks is causing the mass destruction of tens of thousands of acres of precious Pacific Northwest forests. Personally, we’d prefer people handling WMDs to be aware of what the devices are capable of at the very least, wouldn’t you? Both Oregon and Washington need to ban the sale of all fireworks. Banning the sale of fireworks isn’t limiting American rights. There’s no amendment guaranteeing the right to firework use. Want to argue “freedom of speech?” Okay. The first amendment protects the freedom of speech, not the freedom of expression. The United Nations Declaration of Human Rights does protect the freedom of expression, however that freedom is protected only so long as that expression doesn’t hurt fellow citizens or damage their property. Whether used with proper safety precautions or not, fireworks often misfire and cause fires as demonstrated with the tragedy taking place before our very eyes. We’re not advocating a ban on fireworks when used in professional displays like the ones at the Portland waterfront or at Fort Vancouver. We’re advocating a ban on all fireworks sales to personal consumers in Oregon and Washington. In light of current events, we believe it’s time for both states’ legislatures to realize that all fireworks are incredibly dangerous to people, property, and the environment, and there is no need for personal consumers to use them. It’s time. Contact Oregon and Washington’s governors. Use the contact information below and use your preferred method to reach out and ask our governors to #BanAllFireworksSales or #BAFS. Oregon residents should contact their representatives. If you’re an Oregon resident, find and contact your local representative using the legislature’s website: https://www.oregonlegislature.gov/house. Ask them to reach out to the leaders of Washington State to encourage them to to #BanAllFireworksSales or #BAFS. Reach out to Washington’s State Representatives. Both Oregon and Washington residents can contact these representatives to encourage they introduce legislation to #BanAllFireworksSales or #BAFS. Stumped in Stumptown welcomes and encourages informed and insightful debate. Do you feel strongly one way or another? Leave your opinions in the comments. Please note, comments with unfounded accusations and unjustified statistics will not be approved. While opinions are welcome, lies are not.